We will be accepting registrations for the 2019 Spring baseball season starting November 18, 2018. If you have a child interested in playing for EBA this coming spring, please register as soon as possible. Due to league commitments and for planning purposes, we need to solidify our rosters for the Spring season by mid February. We make every effort to place every registered player on a team. Depending on the number of players registered in an age group, we may not have enough to fulfill a team and will provide refunds and/or other options for the players that are not assigned to a team. Coaches use evaluations, workouts, and/or prior coach feedback to assign players to teams. 10U: 8-10 year olds (We have travel teams and in-house teams. Read more in the details below). 12U, & 14U are Travel teams that will play in the LCYBL and will play thoroughout the Lancaster County and surrounding area. Age Chart: All age groups have a cut-off of 4/30. As an example, two players in the same grade with one having a birthdate of 4/30 and the other born on 5/1, they could be in different age groups. When doing the online registration, your age group options will display based on the age you listed in your account setup. The registration fee does include part of the uniform. Please see the Uniform & Equipment section for details. Fundraiser is required unless you choose to opt out of during registration for $35. You can also choose to pay the $35 when the fundraiser is due (aka opt out later). Details of the fundraiser will be communicated when they are decided. Multiple-child discount of $35 for each player registered after the first player is automatically applied with online registration when all players are registered at the same time. Late Fee: Any registration after the "Registration Deadline" will be subject to a $20.00 late fee. All players registered before the February 1st are guaranteed a roster spot on a team. Refund Policy: If a refund is requested, we reserve the right to reduce the refund by any costs that we've incurred. Examples of those costs are registration fees, uniforms, league fees, etc. 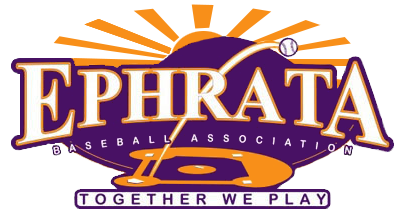 Submit your request via email to info@ephratabaseball.org with the player's name and reason. If approved, you'll receive a refund within four weeks from requested date. Financial Assistance can be requested by emailing info@ephratabaseball.org. Please include your player's name, age level, and we will help in anyway we can. Teeball and Coach Pitch Teams will begin practicing in late March or early April and you'll hear from your coach with more details around that time. Typically, a team will practice 1-2 times per week and when games start it will be a max of 3 times per week. Each coach makes their schedule according to field availability and other variables. No events are scheduled on Sundays unless weather cancellations require make ups. The season typically ends in early June but your coach will provide your schedules. Please note any scheduling conflicts during registration and we'll try to accommodate. We ask for your child's school as we try to place them on teams that will practice close to that area. 10U/12U/14U Travel Teams: To assist with team assignment for the travel teams, we provide an evaluation opportunity. The evaluation rubric can be found here and if available, we use input from prior coaches to help assign players to the appropriate section and team. The evaluations for 10U/12U travel teams are on December 8th and 15th for which you will select the one time during online registration. The top evaluated players at 10U/12U will be invited to winter workouts that will begin in January/February. Coaching availability and limited facility time requires us to limit the number of players invited to the workouts that help solidify section placement. For 14U, all players will be invited to winter workouts and will also begin in January. All players registered before the February 1st are guaranteed a roster spot on a team even if they are not invited to winter workouts. All 10U/12U/14U travel rosters will be determined by late February and coaches will then communicate team practice schedules and season expectations. Your coach will determine their team's practice frequency and schedule but you can usually expect 3-4 practices per week and then 1-2 games per week beginning in April. The regular season ends in mid-to-late June and if playoffs are achieved then the season may continue through mid-July. Coaches may also enter their team into tournament(s) and that will be explained at the beginning of the season. Please let your coach know of any scheduling conflicts as soon as you know and remind the coach as you progress through the season. Each player is required to have a hat and glove for practice's and game's. Uniforms are required for games. Non-metal cleats are recommended. During registration, you’ll be asked to select a hat size of either Adult or Youth. If the coach (applicable to travel team coach’s) selects a Flex style, each player will be measured. Each player needs baseball pants. For games, every team 14U and under will wear straight leg gray pants with a single black stripe that will go to the shoes. No special socks are required. You may purchase these during registration or from another location. Our prices are $20.00 for Youth sizes and $26.00 for Adult sizes and a belt is included. Measurements are for the waist. The length is adjustable with velcro. Youth 21-23" 23-25" 25-27" 27-29"
Adult 28-30" 32-34" 36-38" 40-42" 44-46" 48-50" 52-54"
Helmets: Important: The charts in this document are only guidelines. Please order the bigger size if questionable. If the wrong size is ordered, parents will need to pay for the correct size if we do not have inventory. The EBA provides batting helmets for all practices and games. You may purchase one for your player to use but you do so at your own risk as the quality rating varies. During registration, you can purchase a helment with an “E” sticker at our discounted cost from our supplier. Sizing will be done by early April for these. For travel teams, only helmets with an EBA approved logo can be used at games. For Tee Ball and Coach Pitch leagues we use the "safety" balls. This is to encourage confidence during the early years. For all other age groups, we use the appropriate hard baseballs for that age. All teams in the EBA will be able to use bats that comply with pre-USA bat standards or the USA bat standards. Batting gloves, mouthguards, chestguards, equipment bags, and other equipment is not provided by the EBA. The EBA is not responsible for the loss or damage of any equipment purchased or owned outside of the EBA. If you would like to sign your child up to play, you can register in one of the following ways. Online Registration: To register your child online, click here. It’s a fast and easy process to get your child signed up for the season. Mail-In Registration: Download & print the form and mail the completed form & payment to the address listed. In-person: Sunday, March 10th 2 pm - 3 pm at the EBA Academy Facility 300 W. Chestnut Street Ephrata (entrance on Park Ave). Please see age chart with registration dates. Please register online if the deadline for your age group is before this in-person date. If you have any questions, please contact our Registration Coordinator at info@ephratabaseball.org. We need your help as a board member, coach, Team Mom, field crew, etc.